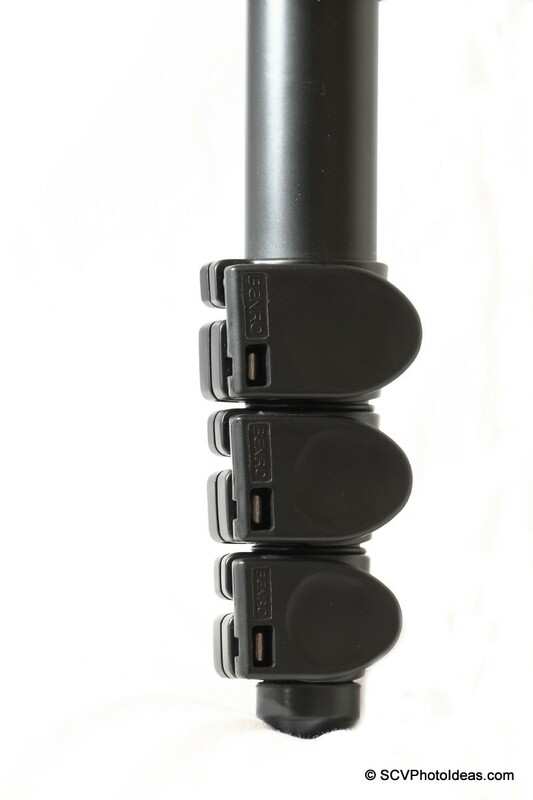 Sometimes, in tight situations when a tripod is bulky to use, comes the solution of the monopod. 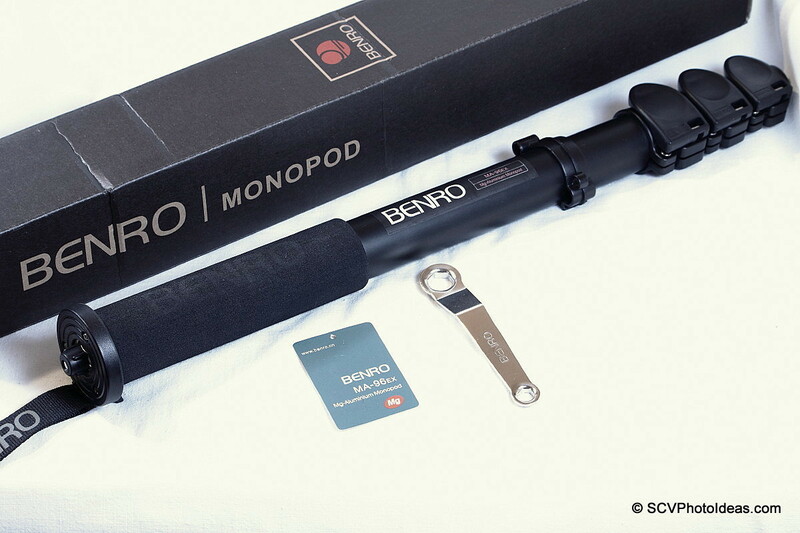 Having used or tested various monopods of different design and brands, I came up with some prerequisites. b. Resistance to torsion and vibration. e. Balance by keeping the center of gravity low ! 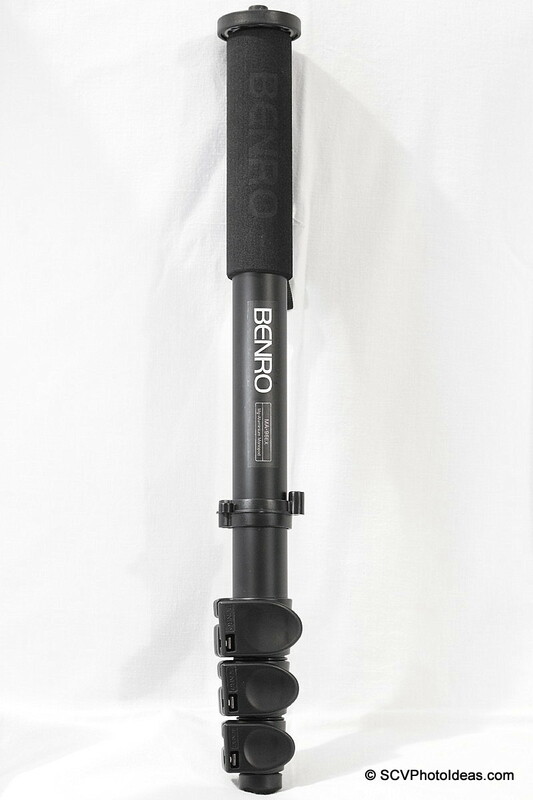 Searching for a monopod that would fulfill the above prerequisites and that would not cost a fortune, I came up choosing the Benro MA-96 EX. 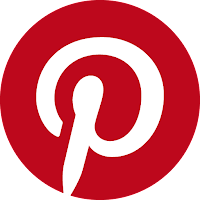 Its large tube diameter of 3.6cm (1.42") that gives a nice grip and low resonance. 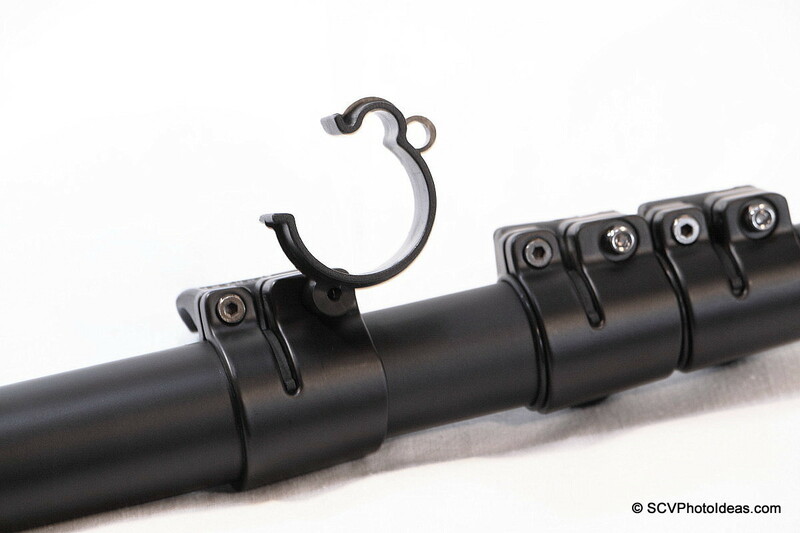 The quick flip lock design that makes setup very fast and enables for a manual adjustment. Its maximum height of 1.59 m (62,8")is very convenient to me personally as I avoid bending my back for viewing into the camera viewfinder. 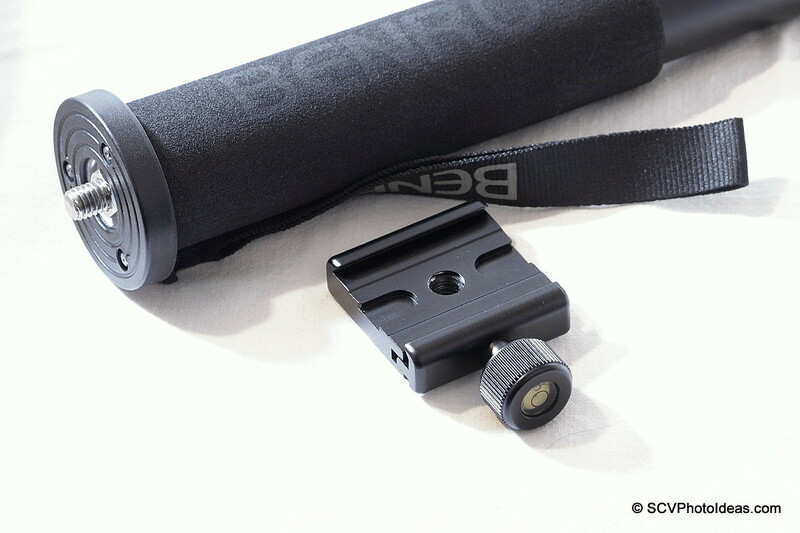 The medium weight that balances very well with semi-pro and pro cameras. And finally a very reasonable price. 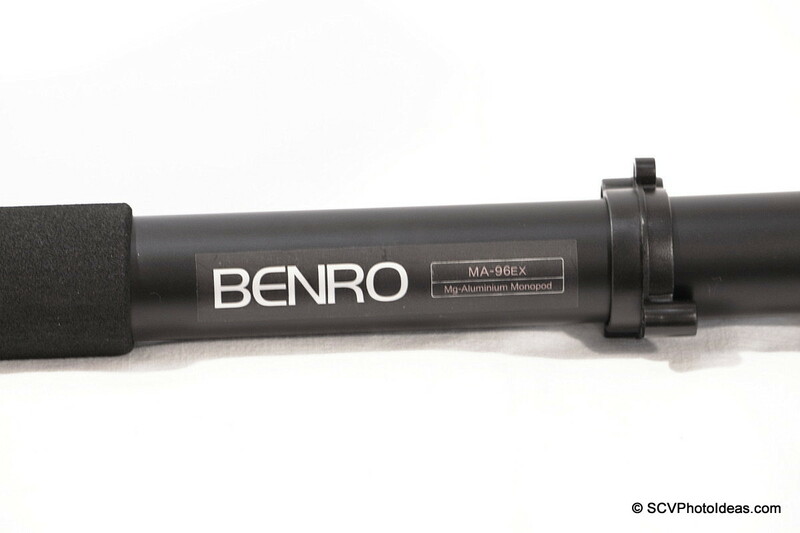 Benro MA-96 EX comes boxed with a metal spanner that enables for camera/head plate removal or flip lock adjustment. 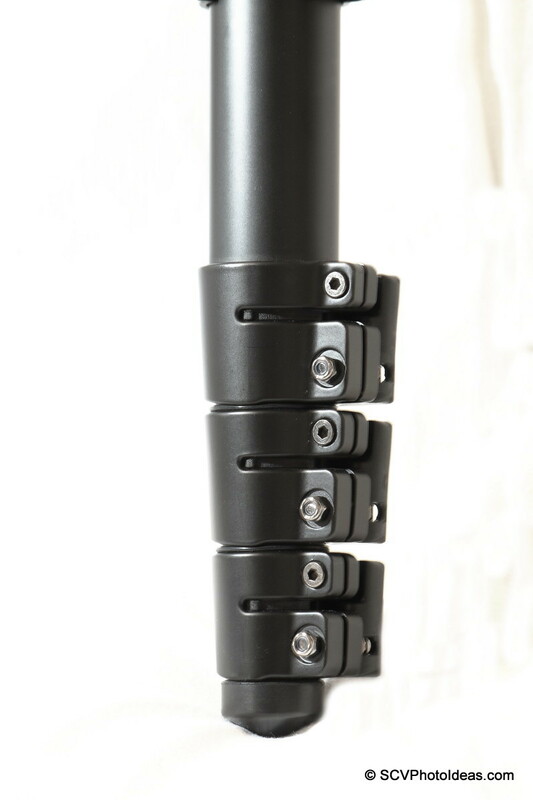 The 4 section monopod has a large top plate, a hand strap, a plastic ring that serves as a spanner for flip lock adjustment and also for an Allen hex key repository (which I would not recommend for this use, as it is very easy to loose it on the way) and 3 Large Flip Locks. Closer view of model tag and part of the plastic ring that has a spanner for flip lock adjustment. Using the included metal spanner the top plate can be removed. Here it is obvious that it has a dual thread (1/4"-20 / 3/8"-16) reversible stud and a protective rubber cover for the stud threads for transportation. The large metal top plate has a diameter of 5,6cm (2.20") and 3 recessed Allen hex screws for securing a ball head. Fully extended is 159cm (62.8") high. This 4 section model has 3 really large flip locks of fine plastic. 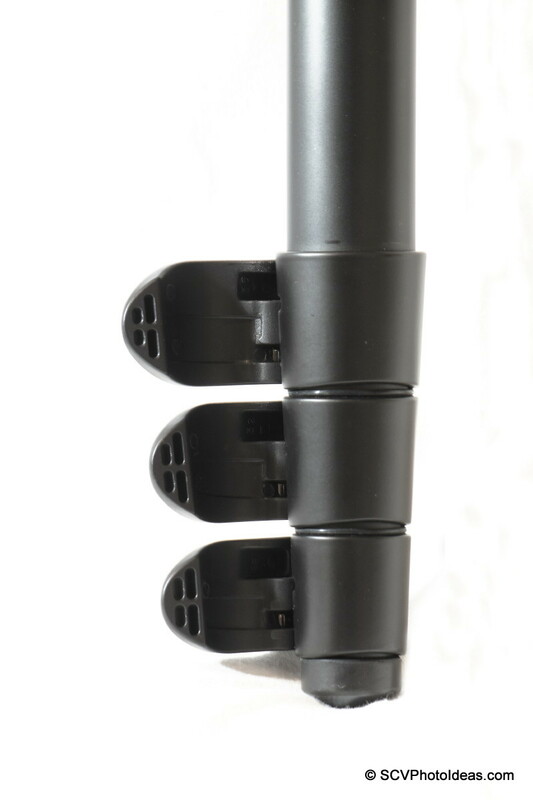 Considering the large tube diameters the flip locks are accordingly large and secure the leg very well. 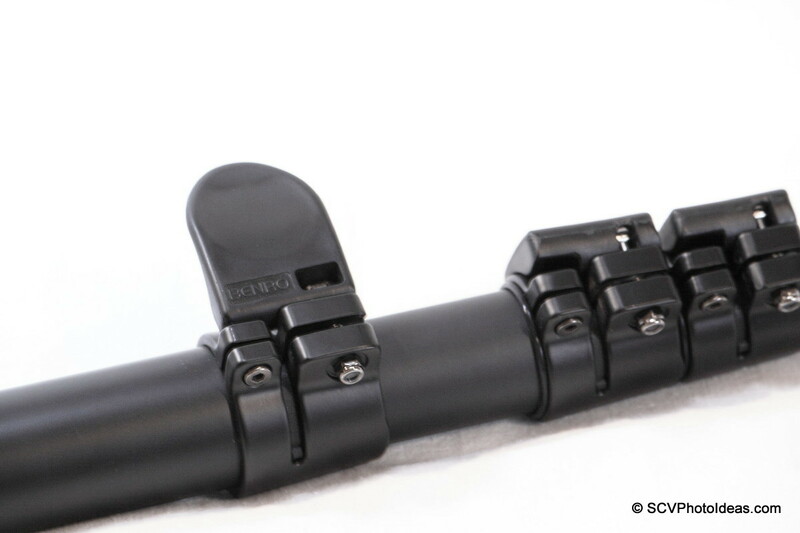 The flip locks have 2 bolts each, one securing the lock on the upper tube and one adjustable for securing the lower tube(s). Opening the flip locks reveals the tensioning bar which has the bolt on the other side. 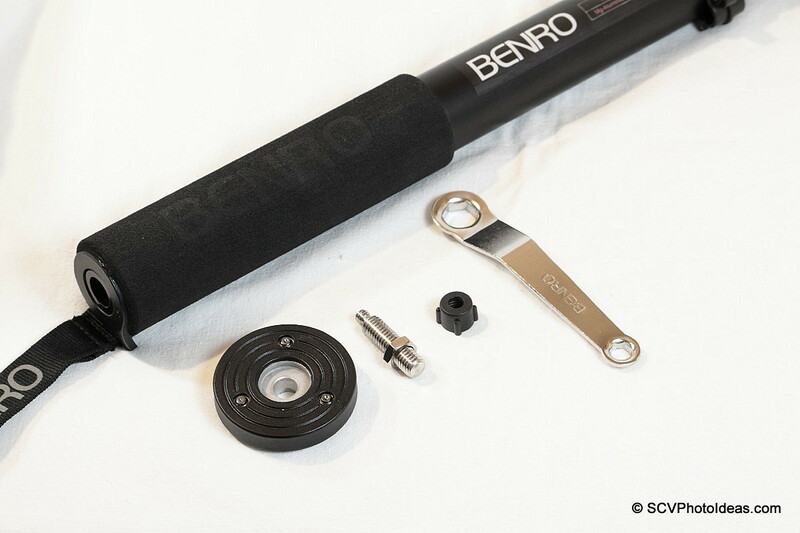 The monopod foot is large and holds well on wooden or marble floor surfaces. 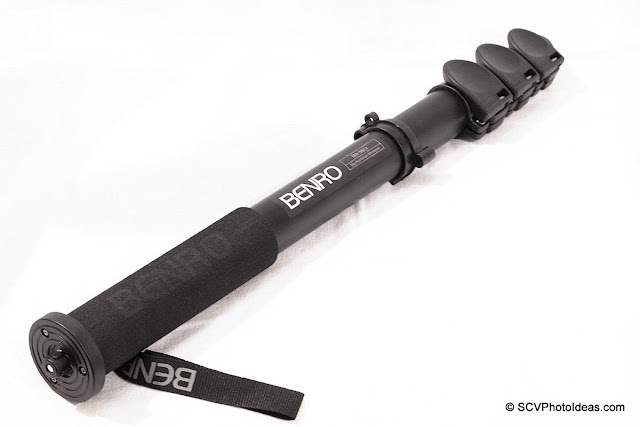 Unfortunately it is not removable as with most Benro tripods so as to be replaced by a spike for slippery terrain like grass, mud or soft soil. 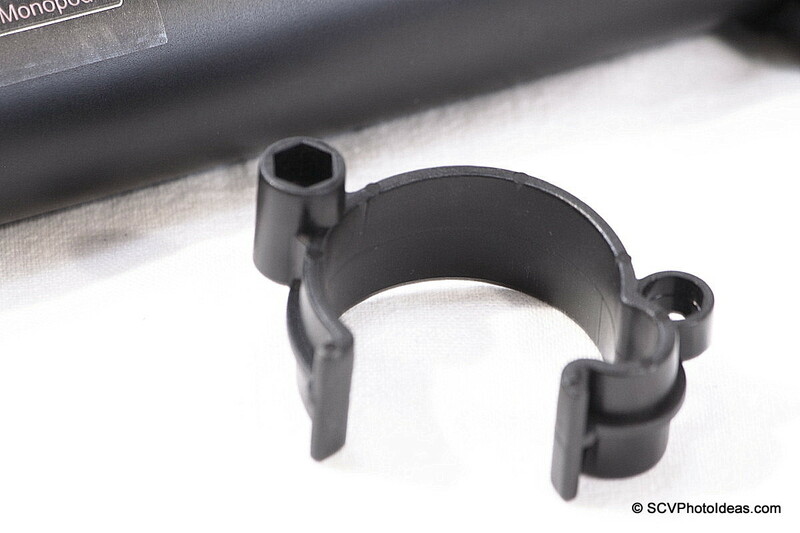 As mentioned previously, there is a hard plastic ring attached on the larger tube, that serves as a spanner for the flip lock adjustment. Closer view of the plastic ring, showing the spanner as well as the Allen key repository. The spanner can be fit on the regulating bolt, and adjust the locking strength as well as the minimum friction for extending or retracting the tube legs. Attaching an Arca compatible clamp. 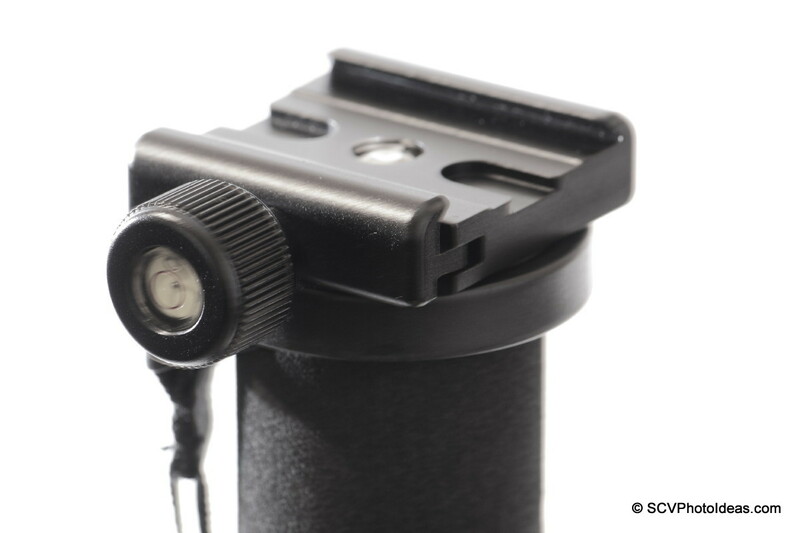 Except for the classic way of screwing/unscrewing the monopod under a camera, it is more convenient to simply attach an Arca-Swiss® compatible clamp with 1/4" or 3/8" tapped hole. 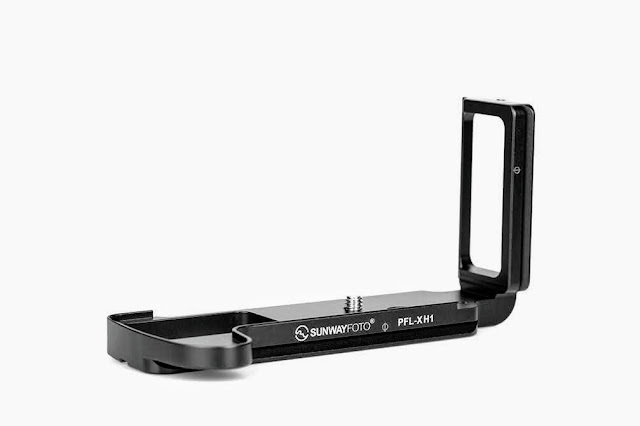 When using long telephoto lenses with an Arca-Swiss® compatible lens plate on the lens foot, this is the most stable and balanced way to go. 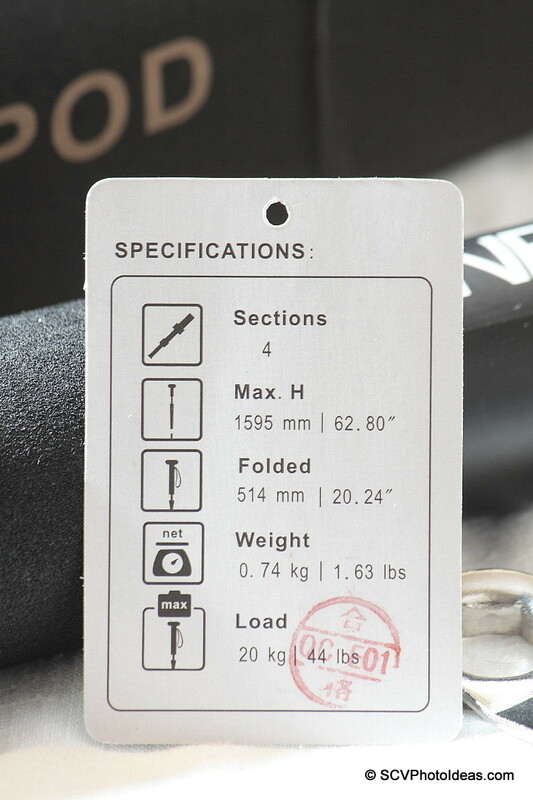 The carrying weight is kept low and the camera - lens - monopod combination have the lowest center of gravity possible. Tilting for portrait, can be easily done by the lens foot ring. 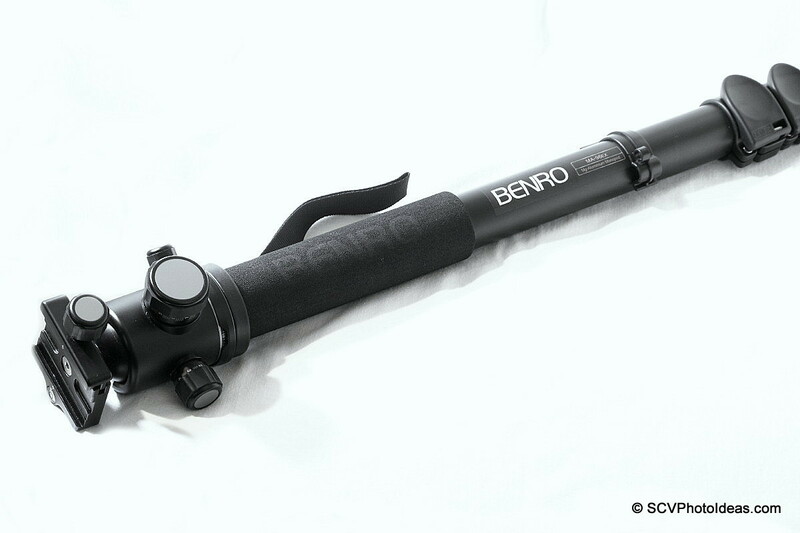 If we need more freedom of movement with a camera + medium lens combination, a ball head like the Benro B-2 here, can be attached on top of the monopod. All you have to do is reverse the dual threaded stud to the 3/8" thread and screw the ball head on top. 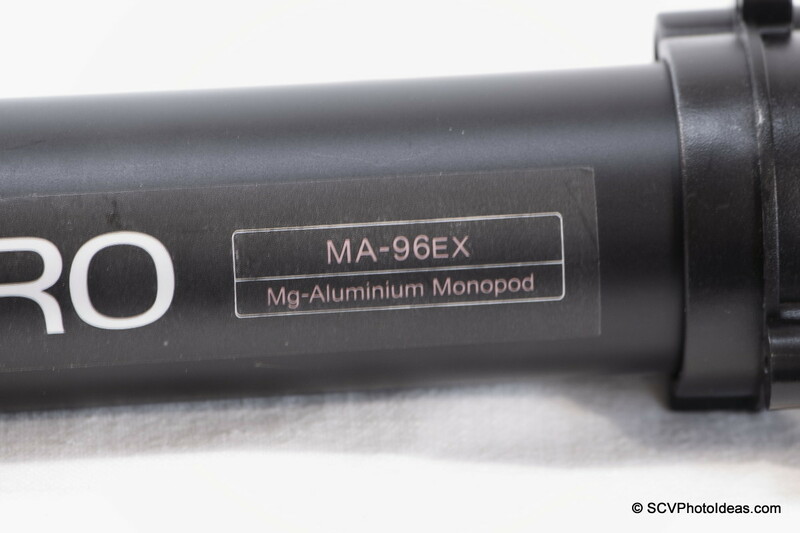 The ball head adds a little weight on top of the monopod but still balances well. 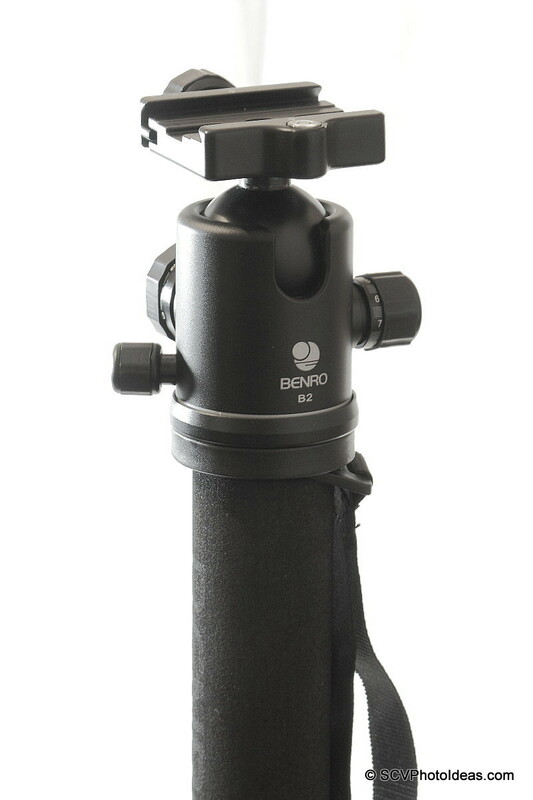 Benro MA-96EX Monopod is no longer available, having been replaced by the newer Benro A48F which almost identical except fore the large foot and is available either from Amazon or from eBay.